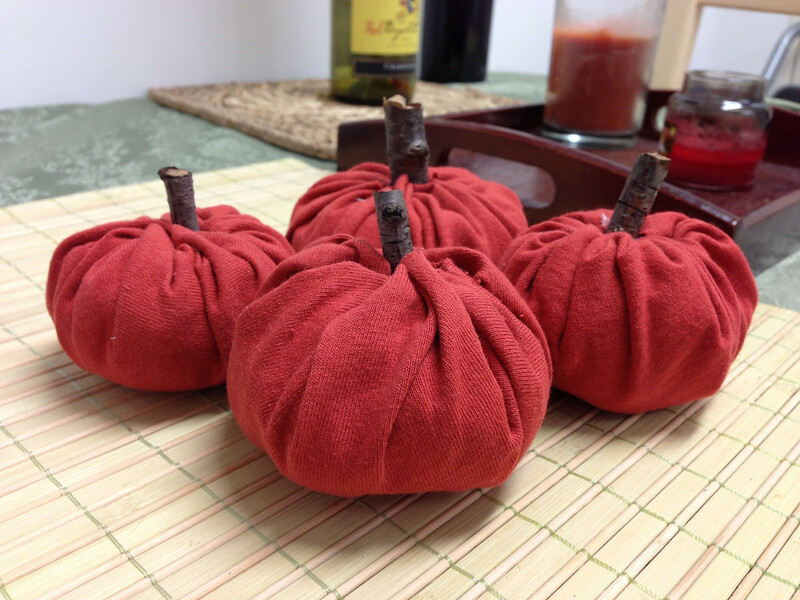 DIY Mini-Pumpkins for Fall Mama Say What?! | Mama Say What?! Fall is in the air and Thanksgiving is on its way! This time of year always makes me both happy and homesick. It also tends to awaken some sort of decorating instinct that lies dormant between the time that the Christmas ornaments get packed up and the time that the leaves start to blush red and orange. But this year I found myself in a new home overseas with no fall decorations at all. Also, I’m serving on the board of a local women’s Bible study as the coordinator of special programs, and my first program was supposed to take place in October. In a foreign country, I’m without many of my familiar resources for throwing a great party on a shoestring budget, and I had to plan this thing in advance without knowing when stores might start carrying Autumn-inspired decorations. So I hit the search engines with my none-too-simple request for a fast, easy, cheap, DIY fall-appropriate decoration, and to my delight, came up with this gem! I just had to share, because I made eight of these adorable mini-pumpkins in approximately one nap time (only because of some trial and error with materials) and it cost me practically nothing because it used materials I already had on hand. It’s also nice to have a bowl or plate to use as a stencil, and a pencil or marker to trace your circles (although they don’t even need to be perfect). I used a rusty orange t-shirt from my rag bag to make the first four pumpkins, but had to buy a $1 scrap of silky orange fabric to do the other four I needed. By far, the t-shirt material was easier to work with. Trace and cut out your circle. You can make your pumpkins whatever size you want, but I made mine approximately eight inches in diameter, and the resulting pumpkins are about the size of my fists. Thread a length of floss through the needle with a knot at the end, and make large stitches all around the edge of the circle. 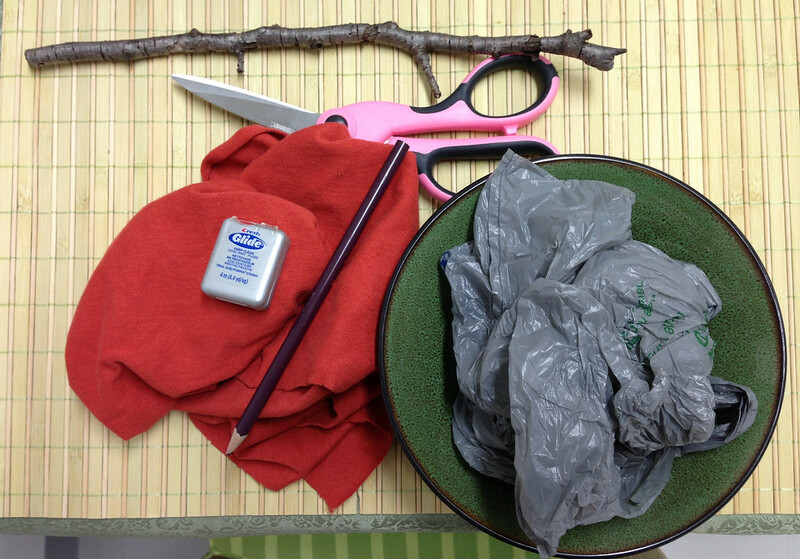 You will want to leave a good amount of floss behind the knot so you can pull it tight and tie it off. Once you’ve gotten back around to your knot, bunch up a plastic bag in the middle of the circle and gently gather the edges up around it. 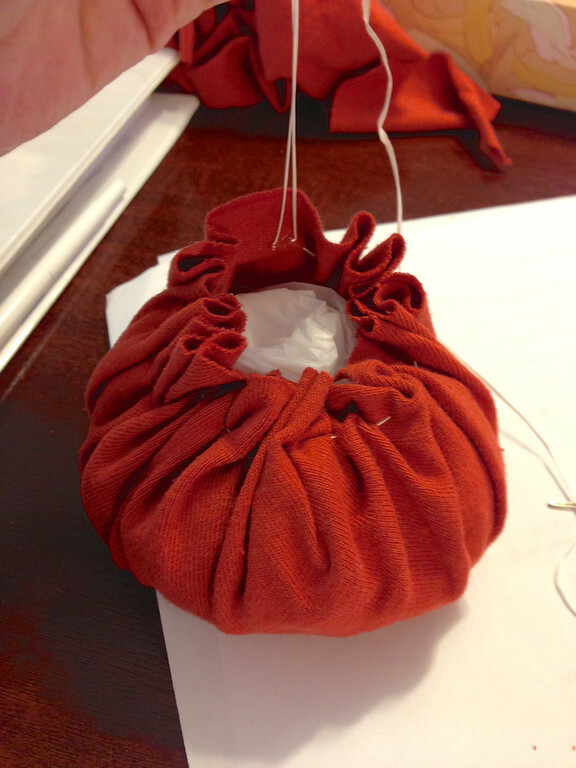 As you begin to pull on either end of the floss, the fabric will ruche together and form into a ball around the plastic bag. 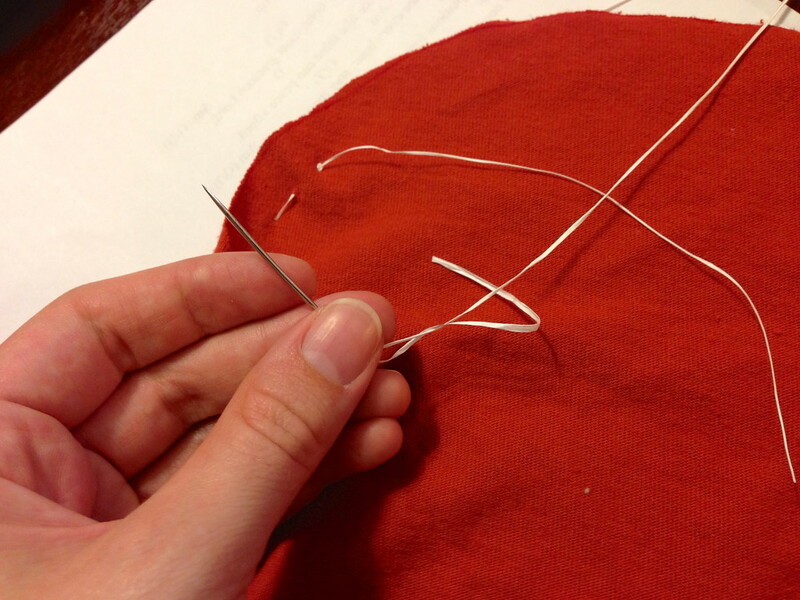 Take a short piece of a stick and poke it into the middle of the opening in the fabric. Then pull the floss to tighten the fabric up around the stick. Tie a firm knot in the floss and trim the ends. Then you can tuck the edges of the fabric down around the stick to hide them. That’s it! How easy is that? It sounded like it might look ridiculous when I actually tried it, but I made four really cute pumpkins in just about half an hour, and I loved the way they looked. I tried using a hot glue gun to make sure the messy edges stayed tucked down around the stick stems, but I can’t really tell a difference in the ones with and the ones without. By far the hardest part was making sure to pull tightly enough that the floss didn’t show when viewing the pumpkin from the top, and my success with that was varied. I think the type of floss you use will probably alter the results a bit. 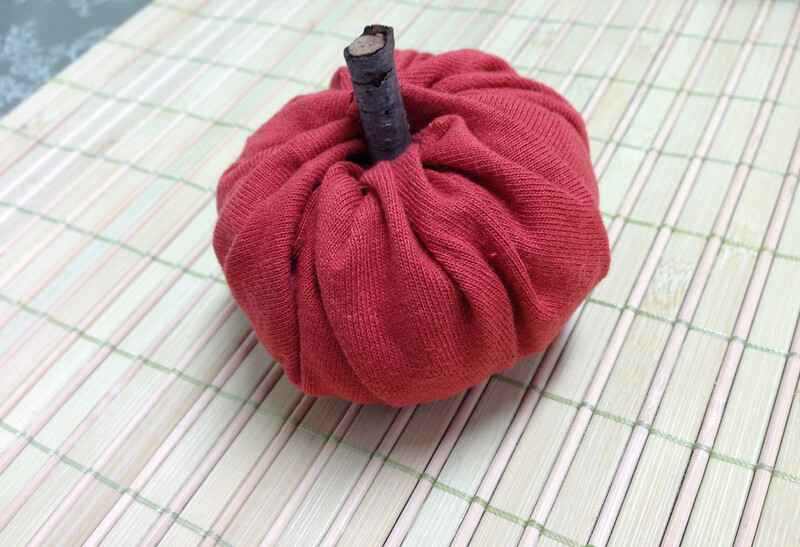 For my next four pumpkins, I tried to use a silky-smooth orange fabric with a regular needle and thread. This was much, much harder because the tension required to pull the pumpkin together kept snapping my thread. So the second batch took me approximately twice as long as the first and required a lot more care and attention. The mini-pumpkins wound up serving as the focal point of my centerpieces for the party. 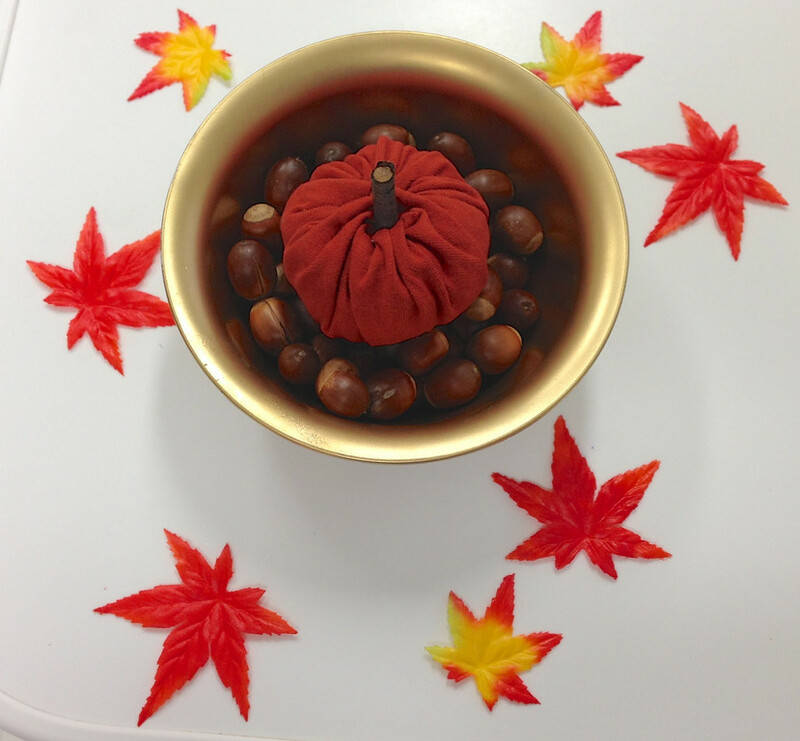 I had my toddler help me pick up acorns outside for just a few minutes a day for about a week, and soon I had more than enough to fill up eight of these pretty gold bowls we had on hand, and nest a pumpkin in the middle of each one. Then I used silk maple leaves I found in a nearby shop to scatter around the bowls. And there you have it! 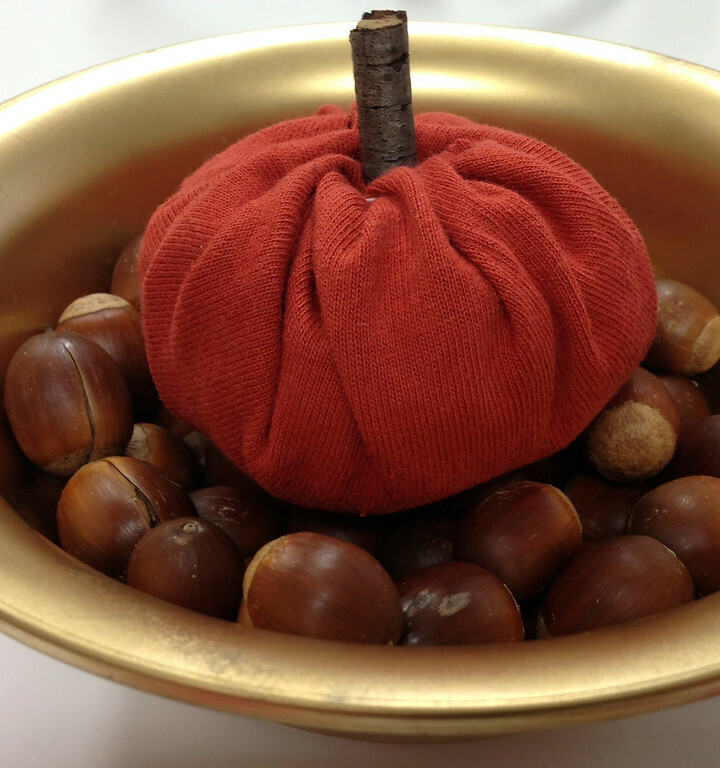 A simple but effective fall centerpiece that was fast, easy, and inexpensive! 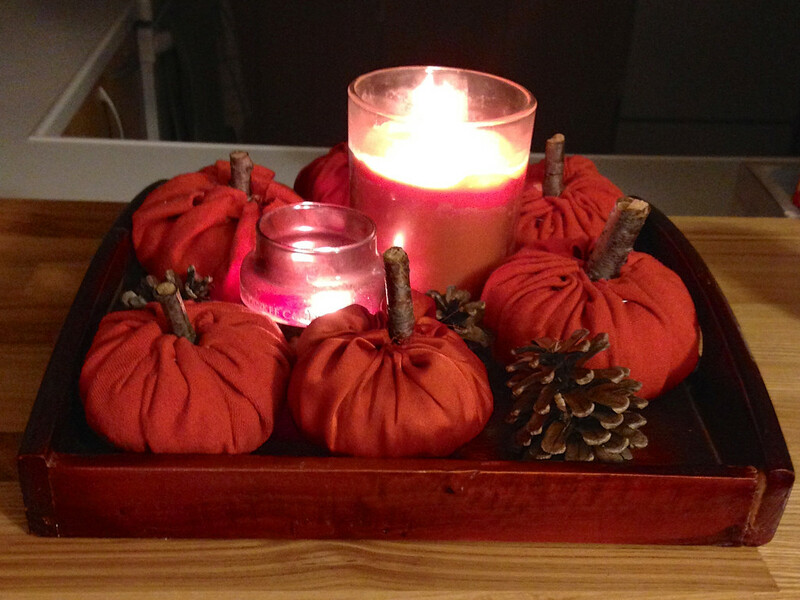 After the party, I tucked these pumpkins into one of my favorite wooden trays with some pine cones and a couple of fall candles, and they’ve been brightening up my kitchen table all Autumn long. Are any of your favorite seasonal decorations homemade? Share your ideas with us in the comments! Real DIY: Pumpkin + Mum = Mumkin! Thanksgiving Cootie Catcher – Free Download! Added by Christina D. on November 23, 2013.